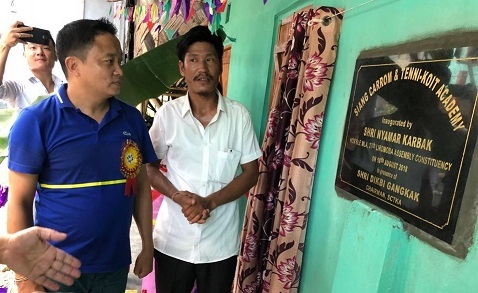 Liromoba MLA Nyamar Karbak in presence of Superintendent of Police (Security) Tojo Karga on Saturday inaugurated Siang-Carrom and Tennikoit Academy, State’s first and only academy affiliated to the All India Carrom Federation and Tennikoit Federation of India at Doimukh near Itanagar. Tennikoit, also called ring tennis or tenniquoits, is a game played in a tennis-style court, with a circular rubber ring hurled over a net separating the two players, with each endeavoring to catch and return the hurled ring into the opponent’s court. The game is particularly popular in Germany, South Africa, Brazil, and the subcontinent nations of India, Pakistan, and Bangladesh. 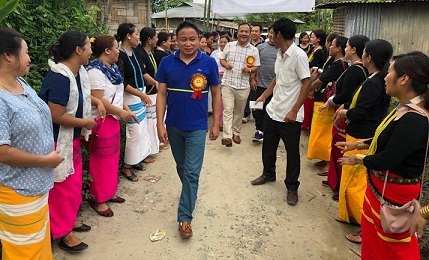 Speaking on the occasion, Karbak, while congratulating the locals for the academy, said that the Arunachal Pradesh Government has given priority after unveiling the ‘sports policy’ in the State. Karbak further highlighted the job reservation quota the Government has in place in all departments for meritorious sports persons and appealed to the youths to take full advantage of sportsperson-friendly programmes and policies of the State Government. SP Karga in his address called upon the youths to be fruitful and align their knowledge and talent in the right direction. Also present on the occasion were Siang-Carrom and Tennikoit Academy chairman Dikbi Gangkak and officials of the Arunachal Olympic Association and Sports Authority of Arunachal.